For each cup desired, measure one demitasse cup of cold water into a briki. Pour one teaspoonful of Greek coffee and sugar to taste. Stir well. Slowly bring it all to a boil over medium heat. The coffee is ready when the froth has risen right up to the brim. Pour the coffee slowly into the cups, dividing the foam equally between each cup. 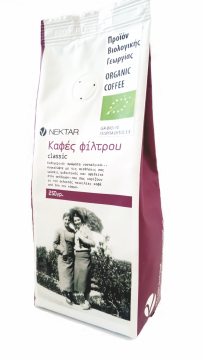 NEKTAR Organic Greek coffee is an ideal blend made from beans grown in organic certified Latin American and African farms. We have created with love and “meraki” exclusively for the non-profit Wise Greece movement 6 aromatic Greek coffees, for good purpose! Six unique blends inspired from the nature and flavors of Greece! Discover the flavor of your taste and don’t forget that with every sip , you help us provide food to homeless and children. Use 2 tbsp ground coffee per 8oz of water. When using paper filter,rinse it with hot water before use. 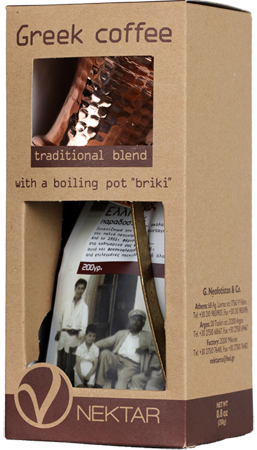 Once brewed,store in a thermally jacketed vessel to keep it hot. To adjust strength,simply add hot water after brewing. Once opened,store in the freezer. Filter coffee with Chocolate aroma. Filter coffee with Hazelnut aroma. Filter coffee with Vanilla aroma. Filter coffee with Caramel aroma. Filter coffee with Chestnut aroma. NEKTAR Organic Coffee is sourced from the Chanchamayu area in an altitude of 1350 m on the Andes Mountains in Peru.